Tomorrow is my second America Anniversary. If you haven't been coming around her long, then you may not know that I used to live in South Korea. You also may not know that I have made my own cheese. (And it was a terrible failure. And not at as important to this story as I may have led you to believe.) The important thing here is that I used to live in another country that I loved. And then I moved back to my home country of the United States of America and I might have cried when we landed. Okay, I totally did. And I still cry just thinking about it. I. LOVE. THIS. COUNTRY. Someone once told me that Americans are self-selected to be dissatisfied. Only the people who were dissatisfied with their lives in Europe came here in the first place. (Which wasn't necessarily a bad thing.) And sometimes it seems like there are people in this country that continue that tradition. It might not be cool to be "proud to be an American" anymore, but I'll tell you something. I will *always* be grateful for the time that I live in this country. And I am proud to be a part of it and to support the military men, women, and families that serve this country. 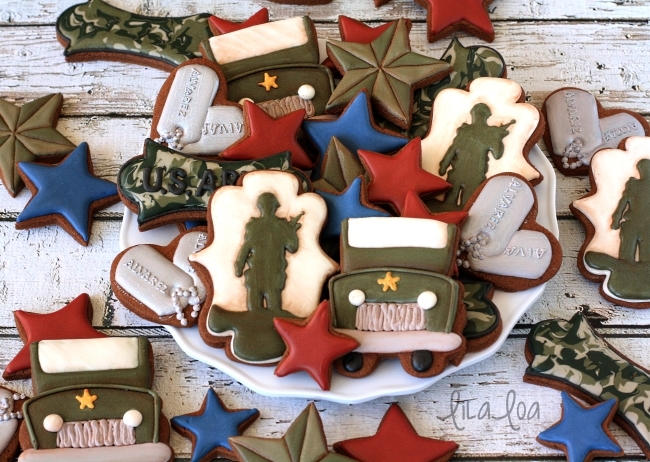 So it's seems like perfect timing for these military cookies. You know, after that whole "camouflage miracle" it just seemed like a good idea to keep going. And now I'm kind of obsessed with these little jeep guys. Want to make some? 1. 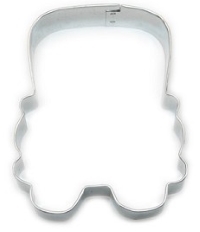 Start with the Sugarbelle bus cutter from Karen's Cookies. Use a straight edge to cut the curved part off the top before baking. 2. 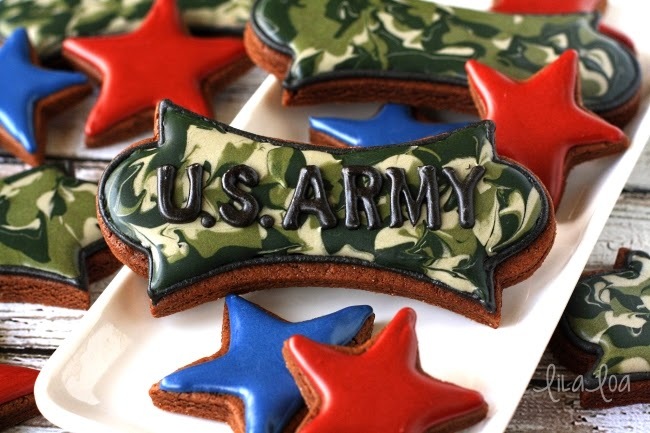 Use medium gray icing to outline and fill the bumper area. 3. Use THICK gray icing to outline and fill the grill area. 4. 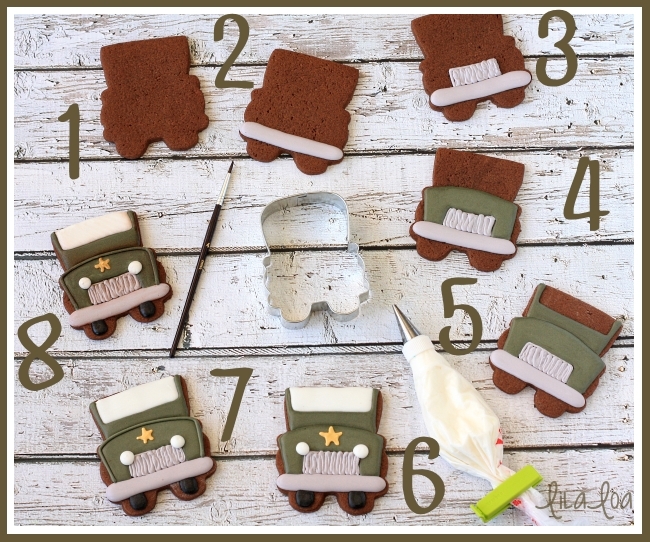 Use medium green icing to outline and fill the hood area of the jeep. Let the cookie dry for 15 minutes at this point. 5. 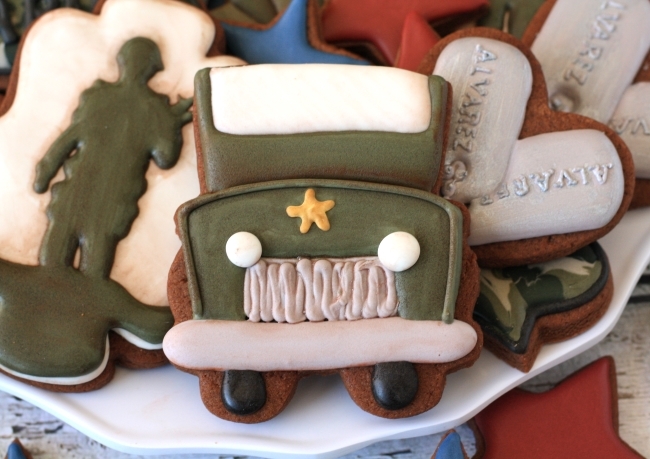 Use the same green icing to outline and fill the front of the jeep, leaving space for the windshield. 6. Use medium black icing to add tires. Pipe white dots for headlights. Use a #1.5 tip to pipe a yellow star on the front of the hood. Add the windshield. 7. Outline the front of the hood with thick green icing and a #3 tip. You can leave it just like that if you want. 8. Or you can paint brown and green food coloring in the cracks to make it look vintage. And in case all of that still seems like too much... I also made you a video so you can see how simple it really is. Grab the Sweet Sugarbelle bus cutter HERE. See how easy camouflage can be HERE. 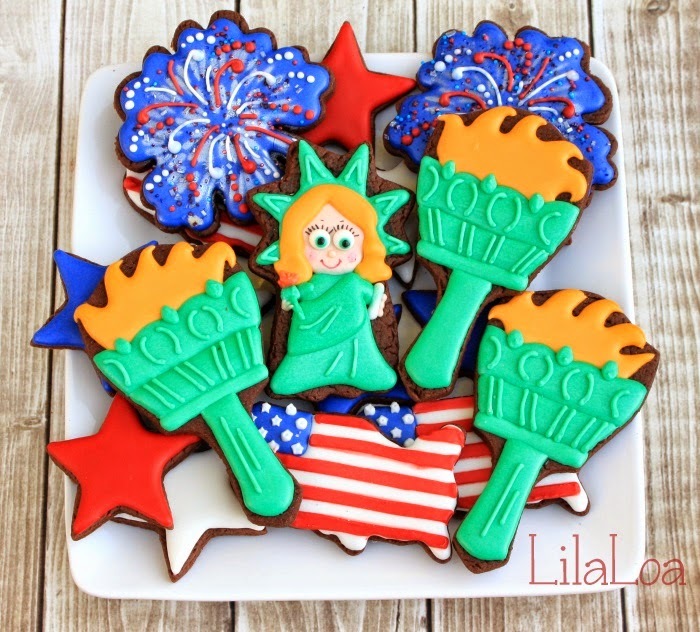 More patriotic cookie tutorials HERE.